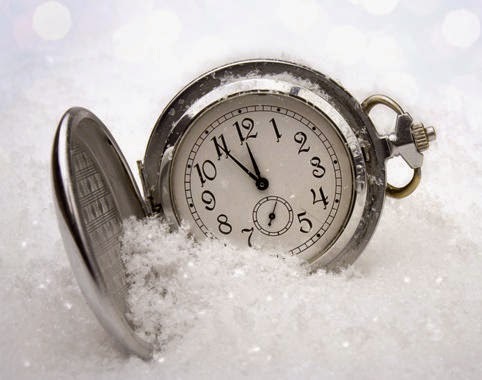 Have you ever dreamed of breaking out of your daily routine? What about buying a one-way ticket to Europe with only a backpack and bike by your side? That’s what Beth Puliti did. The former nine-to-fiver turned freelance writer set off this summer to explore Eastern Europe all from the saddle of her Raleigh Sojourn bike. And while most of us can’t drop our lives for an open-ended adventure, we sure can try. 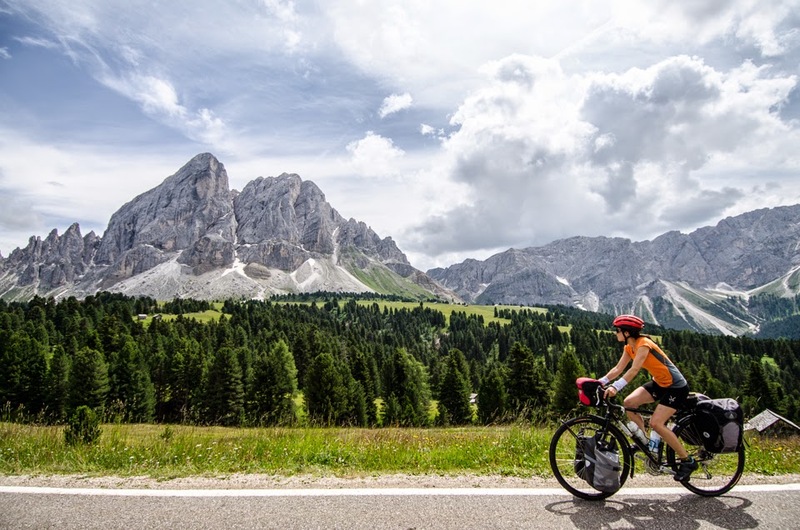 Whether you’re planning a two week escape or a weekend getaway, you’ll want to hear what Beth has to say about planning and executing the perfect bike adventure. Our BEST prices of the season! Monday, Dec. 1, 2014 ONLY. * Snow bikes are excluded. Forbes Magazine published their "Holiday Gift Guide for the Cyclist on Your List" on Monday, and included is the Giant Stance 27.5 1 full-suspension mountain bike. "This brand new model for 2015 was just released, and delivers everything an off-road rider could want for a very reasonable $1,875 price tag: Rock Shox dual suspension with 4.7 inches of frame travel, 120mm travel front shock with lock out, a light but strong ALUXX aluminum frame, 10-speed rear cassette (20 speed total) with mix of Shimano XT and Deore components plus Shimano hydraulic disc brakes." 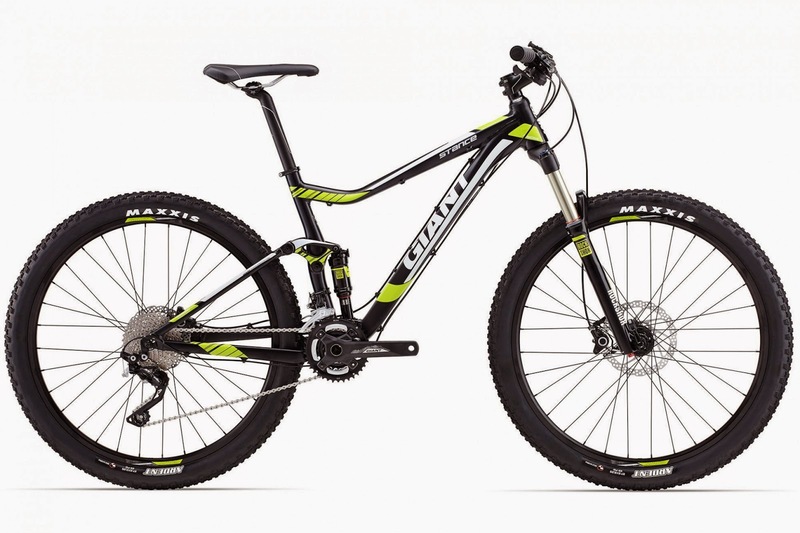 Upgrade to the $2,650 Giant Stance 27.5 0 and you get Fox suspension and a Shimano XT/SLX drive train, or if your budget is a little more limited, go with the $1,450 Giant Stance 27.5 2 with RockShox suspension and Shimano Alivio 27-speed drive train. 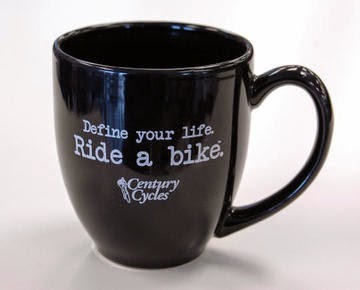 All three are in stock in Century Cycles stores! 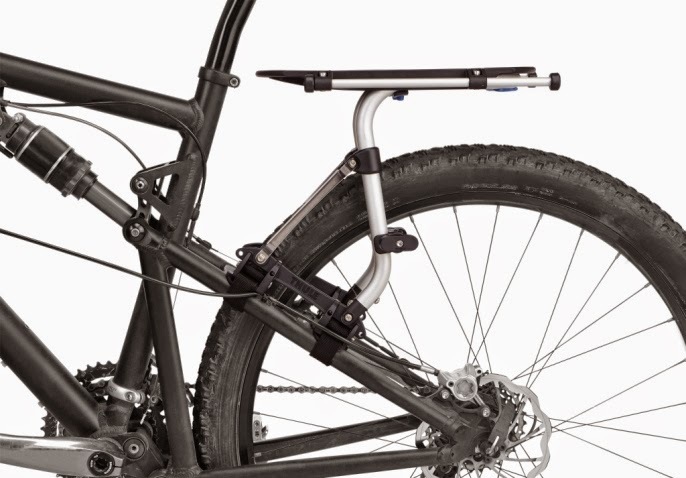 Also on the list is the Thule Pack 'n Pedal Tour Rack, It's a great way to add cargo-hauling capacity to a full-suspension mountain bike or any bike that does not have the eyelets and fittings for a traditional cargo rack. You can put a rack-top bag on it, or add the optional side frames and it's compatible with panniers, for a load capacity of up to 55 pounds! Both are in stock! The Great Ohio Bicycle Adventure has announced their route for the 2015 tour, which will take place on June 20-27, 2015 in the northwestern corner of the state. The ride begins in Van Wert, then goes to Bluffton, Defiance, Bowling Green, Ottawa, and back to Van Wert. The theme of this year's event is "GOBA U. 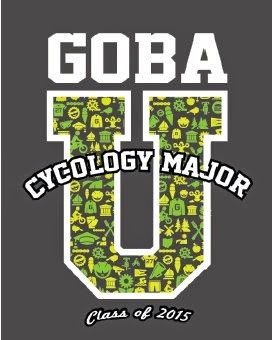 - Cycology Major" with visits and overnight stops at several local colleges and universities. In addition to floor camping and tent camping, dormitory lodging will be available! We roll tonight ... to the bicycle bite ... and for those about to bike ... we salute you! All classes are FREE! Refreshments will be served. 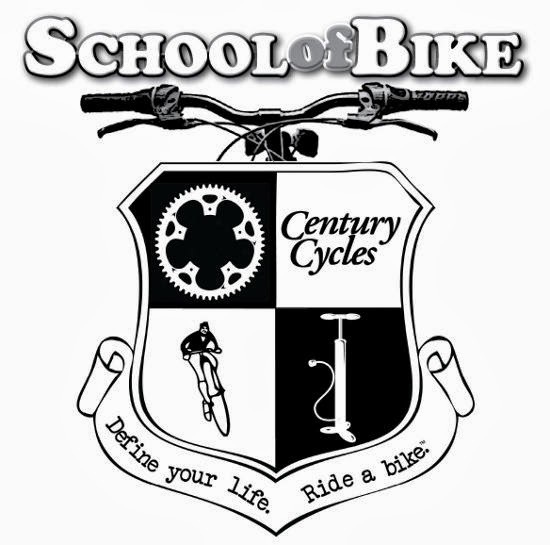 All classes are taught by experienced, patient Century Cycles tutors. You do not need to bring your bike. All students receive a 15% discount off regularly-priced parts, clothing and accessories good at the time of the class. Cannot be combined with other coupons or discounts. This schedule is for our 2014-2015 class season. Learn once and for all how to change a flat tire. A hands-on, rockin’ experience! Bring your front wheel. How to set up your bike and ensure that it is a lean, mean, shredding machine. Clean that gnarly chain and do adjustments without the help of roadies. Ladies only! All about trainers, indoor cycling, and how to stay stoked riding your bike during the off-season. How to dial in your bike’s shifting to a sweet harmony. How to ride to your gig comfortably and enjoy it despite the weather. We’ll show you how to escape your humdrum daily world with a bicycle tour. 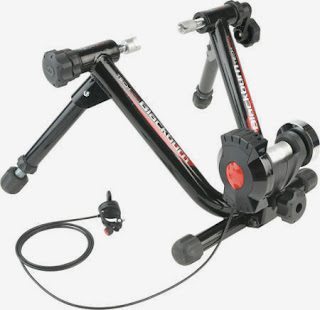 Is having a bicycle fitting session right for you? What is it? Find out without spending a dime! The benefits of being “clipped in” to your pedals. You can do it! Stay upbeat, upright, and in the groove among the gas-guzzlers. Screw the weather, it’s full speed ahead on these fat-tire bikes! Ride one yourself. Go to our Calendar of Events to see a listing of classes and other events in chronological order. 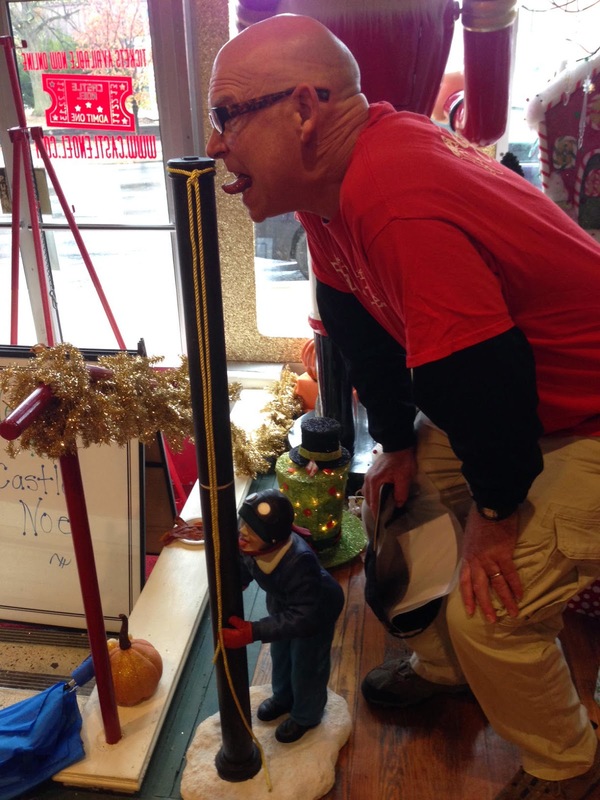 Visit our Winter Cycling Wonderland in Peninsula! 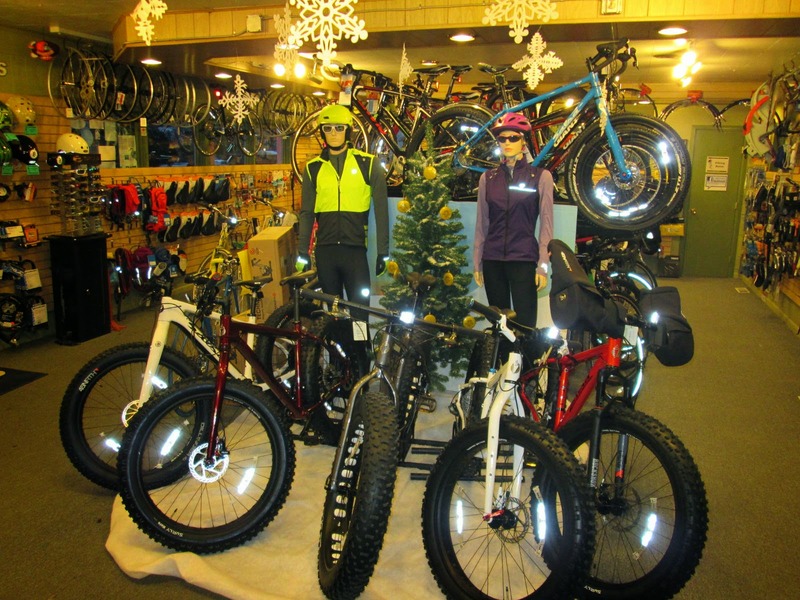 We have transformed the Century Cycles store in Peninsula into a Winter Cycling Wonderland! Here you'll find our widest selection of snow bikes from Salsa Cycles, plus an array of special-purpose cold-weather cycling gear to keep you riding year-round! Cold hands and feet are the most common complaints for winter cyclists. We've got both covered, with innovative products from cold-weather cycling gurus 45North. 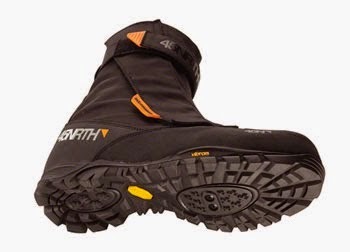 The Wolvhammer Winter Cycling Boots are the warmest bike-specific shoes on the planet. A waterproof-breathable outer shell, Primaloft Eco Gold 200-gram insulation, NASA-approved aerogel insole, and SPD-compatible Vibram sole all combine to keep the elements out and your warm toes in! Handlebar mittens, or "pogies" as they are called, wrap around your hand grips and allow you to wear thin gloves on your hands to keep your dexterity for braking and shifting. The 45North Cobrafist Pogies feature Primaloft Eco Gold 400-gram insulation, and bar-end plugs to keep them at the correct angle and hold them in place securely. Also available from 45North are a range of studded winter tires, and winter headwear, such as the Lung Cookie wool balaclava and Greazy wool cycling cap. Of course, if you'd like to check any of these products out in our other two stores (Medina or Rocky River), just give us a call, and we'll be happy to send them to the store most convenient for you at no extra cost or obligation on your part! New to winter biking? We have snow bikes for rent in Peninsula also! 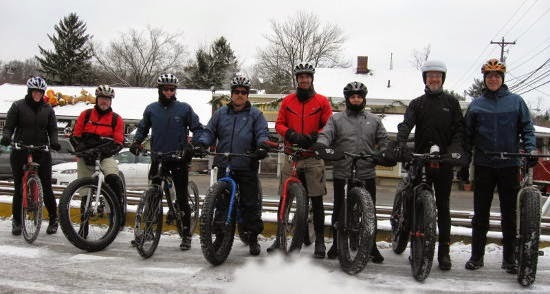 Go to www.centurycycles.com/for/SnowBikeRental for details! Oh What Fun It Is To Ride! Holiday Sale 2014! Season's Greetings! 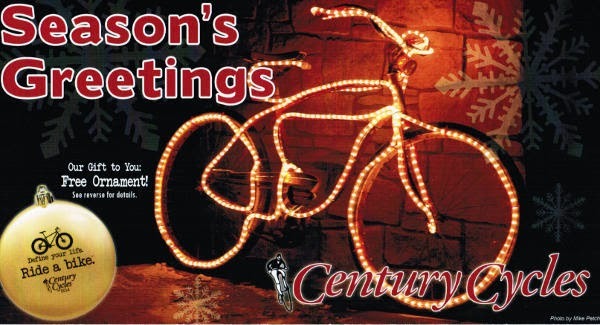 It's time for Century Cycles' annual "Oh What Fun It Is To Ride" Holiday Sale! 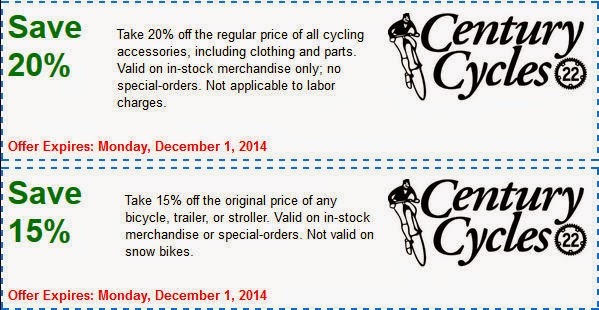 Now through December 31, 2014, use these coupons to find the best cycling deals around on bicycles, clothing, accessories, and service! Get a FREE Christmas ornament with any purchase of $25 or more! ** Within our service area. Other restrictions may apply; see stores for details. If you're an owner of a Surly or Salsa snow bike or off-road touring bike, have you ever wondered what the set of three bolts on the edge of your fork are for? You can use them for mounting extra water bottle cages, but the 3-bolt pattern is also designed to accommodate the Salsa Anything Cage. 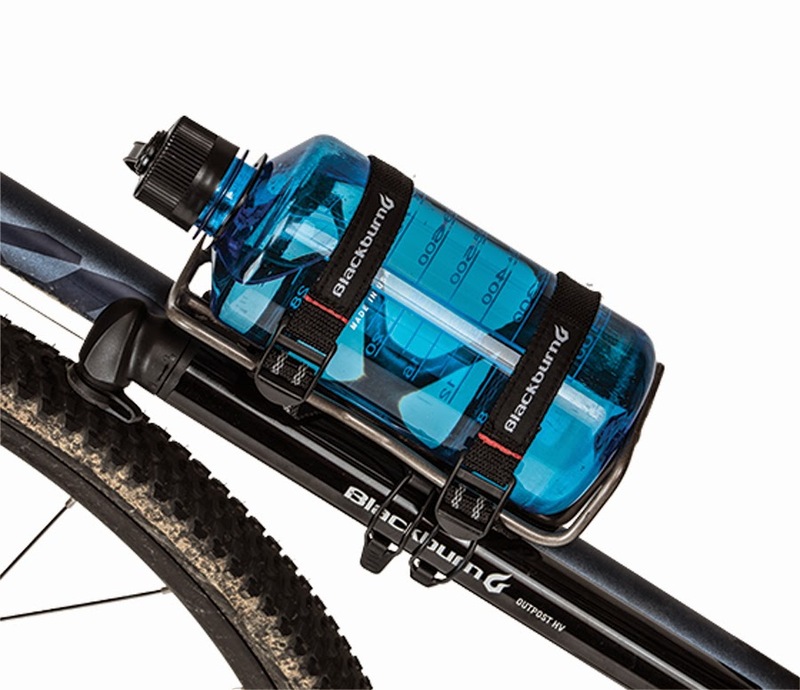 The Anything Cage is like an oversized water bottle cage. It lets you carry, well, just about anything, as the name implies. 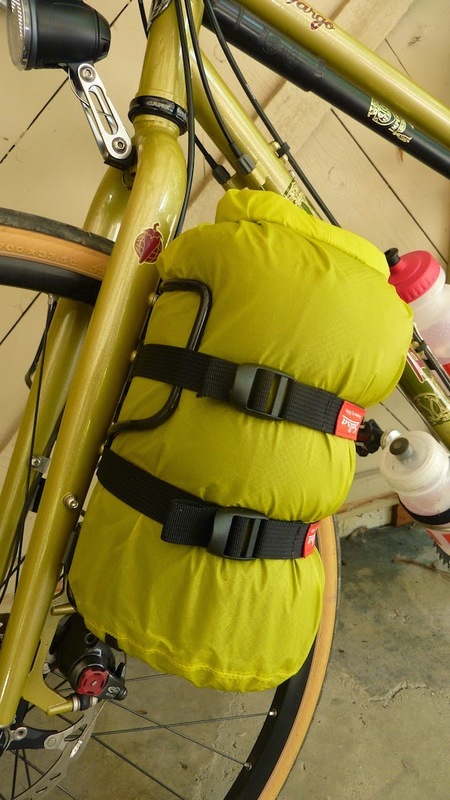 Most commonly, for bike-packing, it's the perfect size to hold your sleeping bag or sleeping pad. It comes with a pair of straps to hold whatever you're carrying in place. Use a waterproof stuff sack (not included) to keep you stuff safe from the elements. A 5-liter sack is about the right size. Coincidentally, the Anything Cage is also about the right size to hold a growler of beer, or any large jug of your favorite hot or cold beverage. Blackburn Design is also getting into the alternative gear-carrying game with their Outpost Cargo Cage. 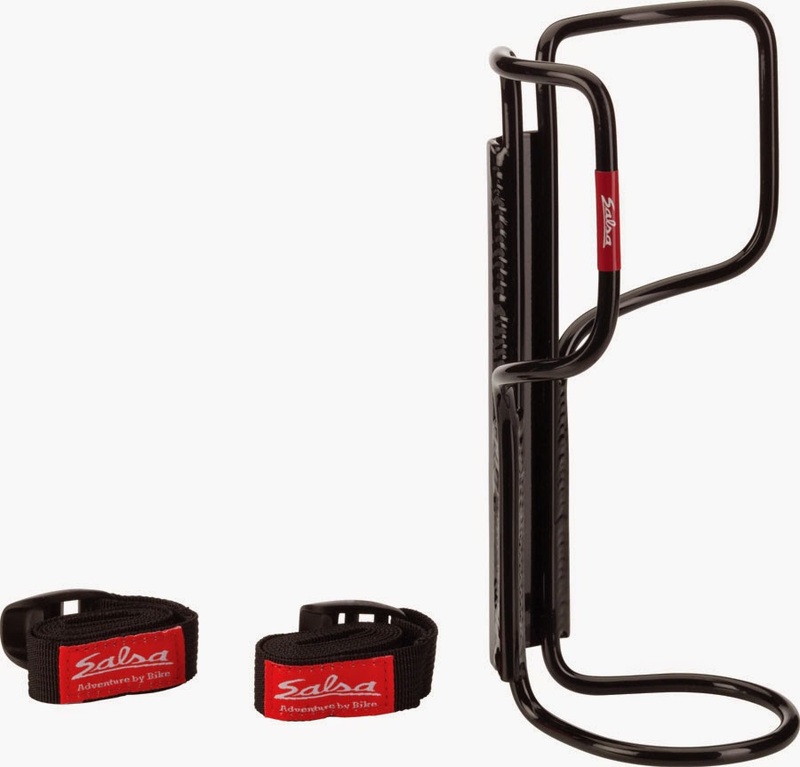 Like the Salsa Anything Cage, it comes with a pair of straps to hold your stuff in place; the straps have a silicone backing for good grippy-ness. The Outpost Cage fits on any standard 2-bolt bottle cage mount. There are three sets of mounting holes on the cage so you can fine-tune the position of the cage to match your frame or cargo size. Use it to carry your camping gear, or your coffee thermos or oversize water bottle! Both the Salsa Anything Cage and the Blackburn Outpost Cargo Cage have a capacity of about 9 pounds each. Both are in stock now at all three Century Cycles stores! New Electra Loft 7D bicycle - endorsed by Oprah! 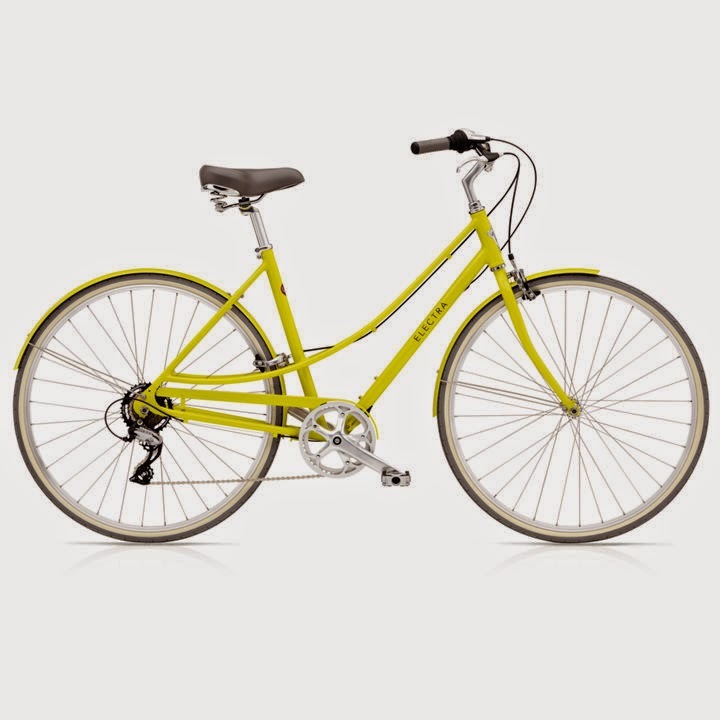 The newest line of fashion cruisers from Electra Bicycles is called the Loft series. They feature the same flat-foot technology, upright riding position, and lightweight aluminum frames like their popular Townie series, but with quicker-rolling 700C tires. 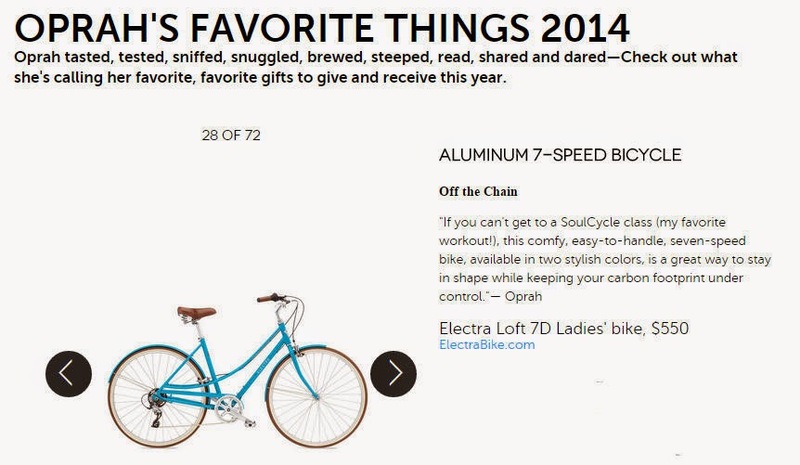 The Electra Loft 7D has been featured in the list of "Oprah's Favorite Things 2014." Oprah Winfrey says, "...this comfy, easy-to-handle, seven-speed bike, available in two stylish colors, is a great way to stay in shape while keeping your carbon footprint under control." Just $549.99 each, and now in stock in all three Century Cycles stores! Available in Teal (shown above) and Citrine Yellow (below). 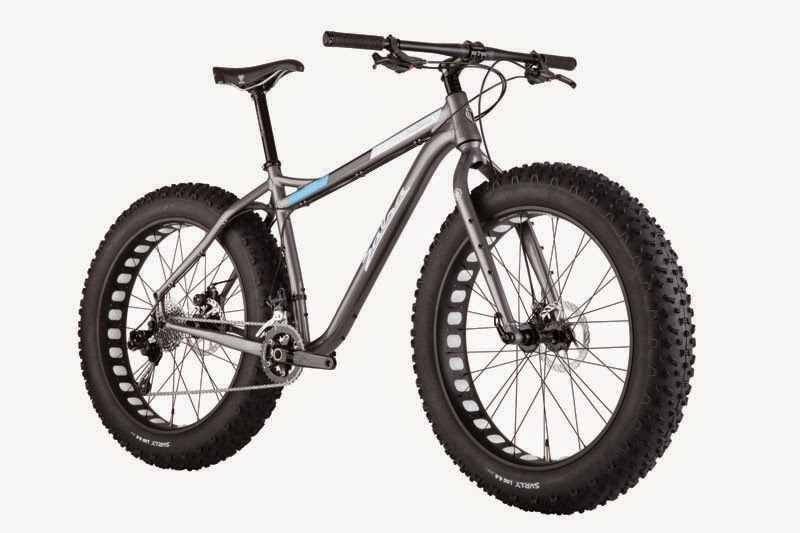 Salsa Cycles takes snow biking to the next level once again with the Blackborow. This expedition fat bike has an aluminum frame and fork designed to handle its 5-inch wide tires with 100mm wide rims, which take you over not only snow, but sand, mud, bogs, and any other terrain your adventures take you. Salsa Cycles Understanding Blackborow from Salsa Cycles on Vimeo. In Understanding Blackborow, Salsa product engineer Pete Koski takes a look at the details of the Blackborow fatbike design. The Salsa Blackborow is now in stock (size Large) at Century Cycles! Our Hot Deals for Cold Days are BACK by popular demand! 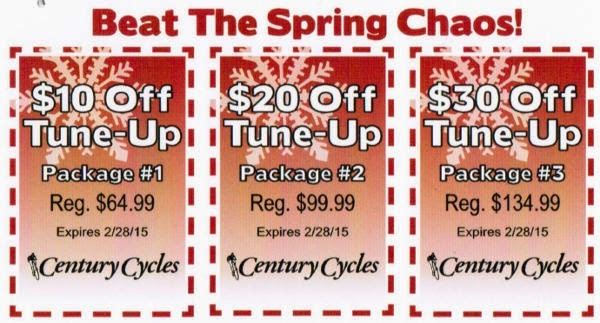 Every winter, Patti The Buyer at Century Cycles negotiates special purchases from our manufacturers for the most popular bicycling accessories, then we pass the savings (30%-50% off) to YOU! A new "Hot Deals for Cold Days" offer comes out every two weeks, now through February. 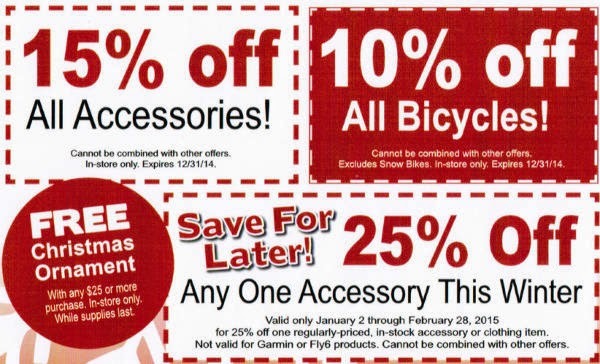 Stock up on essentials, shop for the holidays, and save on your cycling favorites! 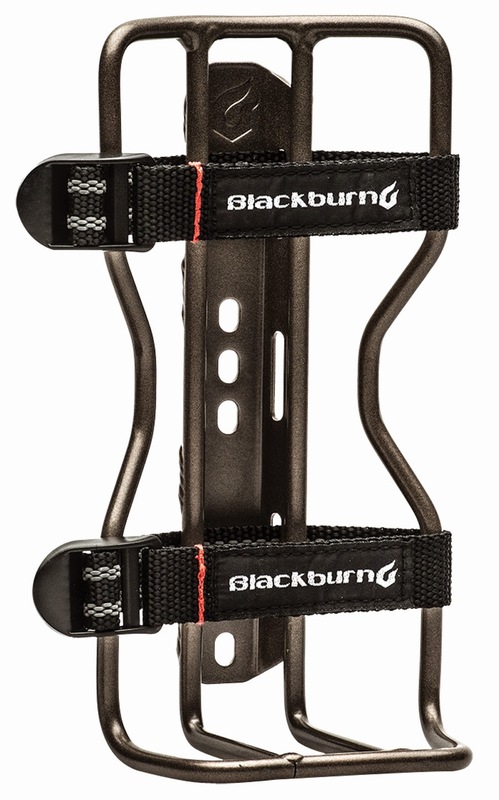 Our first Hot Deal for Cold Days this season is an awesome deal on indoor training -- 30% off the Blackburn Tech Mag 6 Trainer! 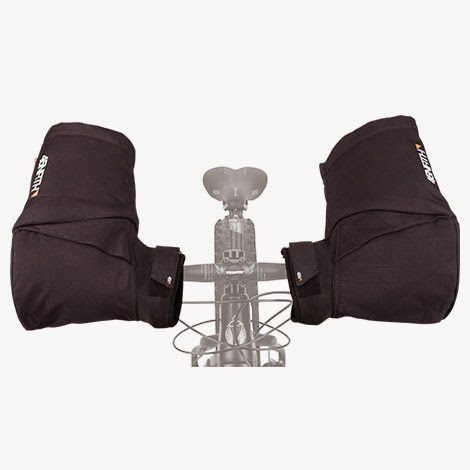 - ideal for use with your bicycle in your own home, for indoor cycling classes where you bring your own bike and trainer, or for taking to a race or event to warm up. The Blackburn Tech Mag 6 (regularly $239.99) features a sturdy steel frame and a silky-smooth magnetic resistance unit with 6 settings that are selectable with a handlebar-mounted remote. All for just $167.99! Never used an indoor trainer? Learn more by reviewing our 5 Tips for Indoor Training. In addition to this special buy, save 15% off all our other in-stock trainers and trainer accessories by Blackburn, Cycleops, and Giant! We suggest the CycleOps Climbing Block and Trainer Mat to help stabilize and quiet your trainer. Now through November 26, 2014! This Hot Deal is good only November 13 - 26, 2014 while supplies last on in-stock merchandise only. In-store purchase only; no online or phone orders accepted. No coupon necessary. 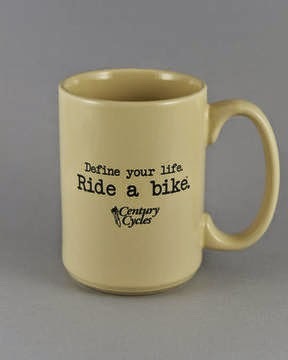 New off-white Century Cycles coffee mugs! Our popular "Define your life. Ride a bike. (tm)" coffee mug is now available in this off-white version, with classic straight-wall styling! We also have the original black coffee mugs available, while supplies last. Only $9.99, or FREE with the purchase of any new bicycle! Labels: coffee, Define your life. Brecksville, Ohio – The National Park Service (NPS) will temporarily close the Ohio & Erie Canal Towpath Trail in Cuyahoga Valley National Park (CVNP), from Frazee House to Station Road Trailhead, from 7 a.m. to 5 p.m. on Wednesday, November 12 through Friday, December 5, 2014. The trail will be open evenings and weekends. No detour is provided. NPS maintenance staff will be dredging and working on the Ohio & Erie Canal. The maintenance dredging is needed to remove accumulated debris from the canal to allow a free flow of water in the canal and to mow the canal banks. The closure is needed for visitor safety. Please respect the closure and plan your visit to the park safely by using different sections of the Towpath Trail during the construction times. Ride your bike and support hungry families with Cranksgiving! Join in on the season of giving by joining Cranksgiving, a nation-wide cycling movement with two options here in Northeast Ohio, one ride in Cleveland and one in Akron. Both rides take place on Saturday, November 22, 2014. The idea behind both rides is that participants are given a list of local stores and items to buy for needy local families. Riders choose their own route to each destination in an alley-cat style fun race. You'll use your own money to buy the items, about $20 in total. Hosted by Summit Cycling Center. Benefits the St. Bernard's Food Pantry. Download a printable flyer here. 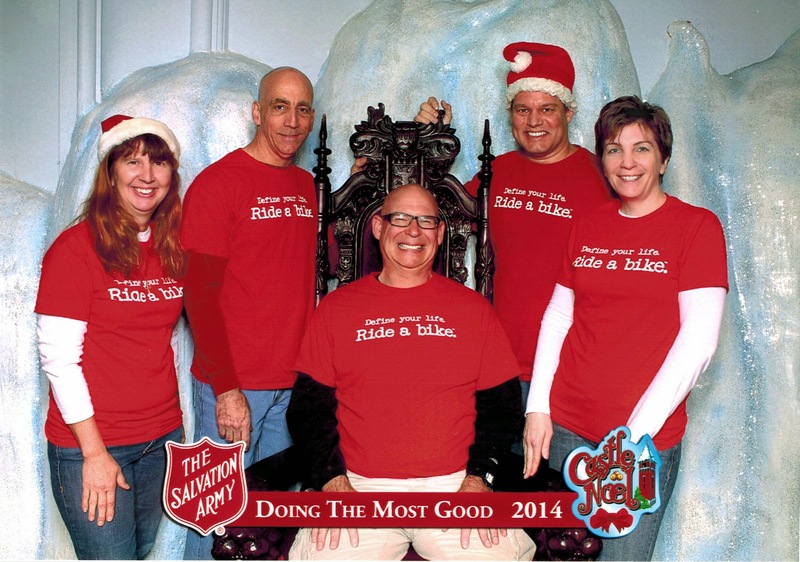 Some of the crew from the Century Cycles store in Medina got into the holiday spirit early yesterday at the Salvation Army's Annual Kettle Kick-Off Breakfast! The fund-raising event was held at Castle Noel. Castle Noel is located in the historic Medina Square, and houses an amazing collection of Christmas-related things to see and do, including Hollywood props and costumes; millions of dollars in New York City Christmas Windows, a Blizzard Vortex, a Santa Chimney Squeeze, and Santa Klaus Mountain where you can ride the slide just like Ralphie in "A Christmas Story!" There's nothing like enjoying a bike ride with the whole family. A casual spin on the local bike path, or cruise through the neighborhood down to the ice cream shop makes lifetime memories. But for you "serious" riders, you find yourself having to choose. Go out on my own for a fast "real" ride, or bring the kids along and resign yourself to enjoying the scenery without breaking a sweat. Now, you don't have to choose. 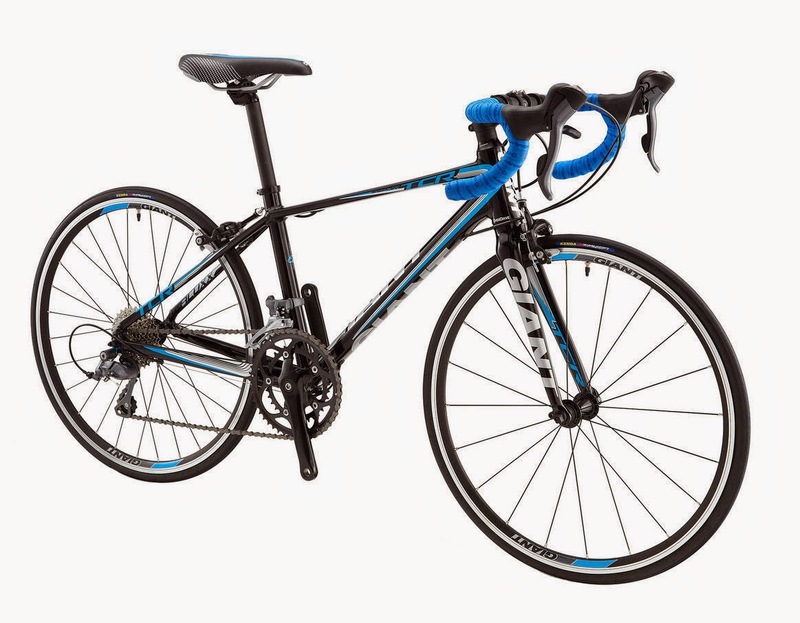 If your young Johnny or Janie Cyclist is ready to take the step up to the next level of riding, but isn't quite ready for a full-size adult bike, check out this new option from Giant Bicycles. The Giant TCR Espoir 24 is a kid-sized bike built like a "real" road bike. It features the same Giant ALUXX aluminum frame as mom and dad's bikes, with Giant's OverDrive tapered fork for responsiveness and control. Add in a Shimano 2x8 drive train, with 48/34 chainrings on the compact crankset, Shimano Claris integrated brake/shift levers, Shimano Claris derailers, and a Shimano 11-30 cassette for plenty of gear range to crank up any hills. The brake levers have adjustable reach to accommodate smaller hands. The 24-inch diameter wheels roll on 1-inch wide Kenda Koncept tires with a smooth road tread. The whole thing weighs in at just 20 pounds 3 ounces, which includes the pedals with toe clips and straps. At $699.99, the Giant TCR Espoir 24 lets your young cyclist go just as fast as you, or dare we say faster? Even with all of our talk about snow bikes and winter cycling, there is a wide range of feeling about riding in cold weather. Many look forward to it, while many say "no way." 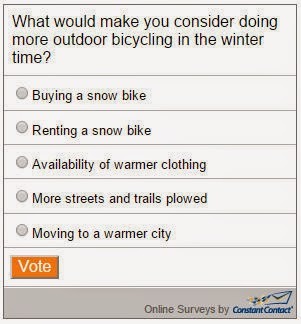 What would make you consider doing more outdoor bicycling in the winter time? Let us know -- Click here to take our latest online poll! Our last poll asked, "How has your mountain biking changed with the new trails available in the Cleveland Metroparks?" A majority of responses (58%) said they are mountain biking more, and encouragingly, 12% said they tried mountain biking for the first time. However, 21% have still never tried mountain biking. You can see the full results of the last poll here. 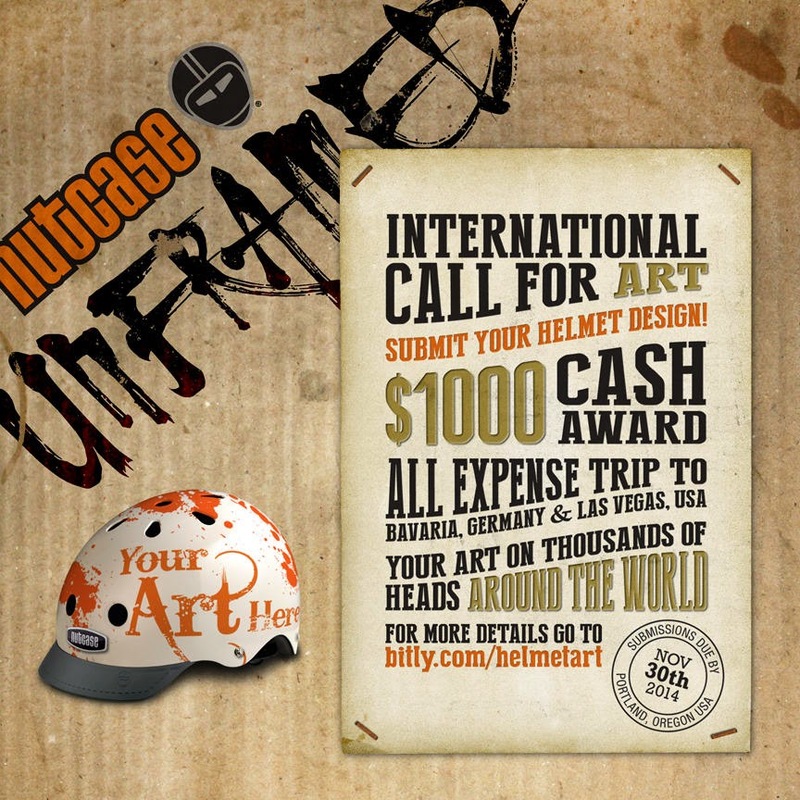 The Nutcase Unframed international call for art entries is on! Break out your paints and pens and come up with a design to appear on a Nutcase helmet. If your design is selected as a winner, you could win $1000, have your helmet produced and sold around the world, and travel to Germany and Las Vegas for two of the world's biggest bicycle trade shows! 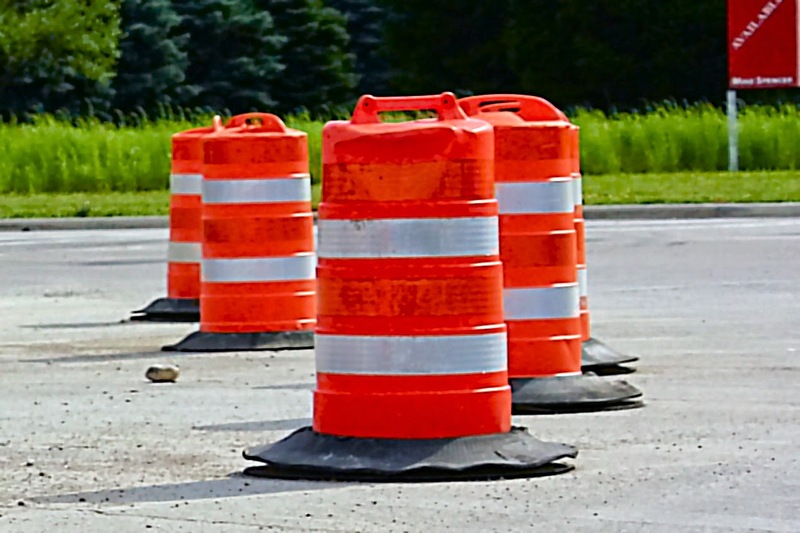 Alan Brubaker, P.E., P.S., Summit County Engineer, would like to alert residents and travelers of a five-day closure of Riverview Road, between State Route 303 and Stine Road, located in the Village of Peninsula. The road will be closed starting Monday, November 3, 2014. Travelers should anticipate using detour routes. The closure is necessary to repair a washout and replace guardrail on the bridge. The official detour will go west on State Route 303, to north on Black Road, east on Boston Mills Road back to Riverview Road. Detour routes will be posted. All work is subject to inclement weather.